Its principal constituents are liquiritigenin and isoliquiritigenin. An aqueous infusion of the wood is used in diabetes. It has been found to reduced the glucose absorption from the gastrointestinal tract and improve insulin and pro-insulin levels. It is effective in beta cell regeneration and has also been found to have a hypocholesteremic effect. Vijaysar pacifies Kapha and Pitta Doshas so it can be used effectively in management of the diseases which originate from aggravation of Kapha/ Pitta or both. The heart wood is astringent, bitter acrid, anti inflammatory, anthelmintic, anodyne. 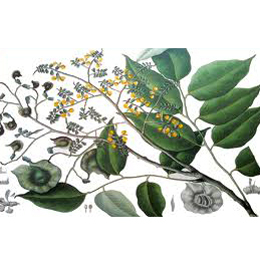 The aqueous extract from the heart wood of the tree demonstrates to reduce the glucose absorption from the gastrointestinal tract, and improve insulin and pro-insulin levels. It also said to be effective in beta-cell regeneration. • Regular use of Vijaysar Glass significantly lowers the blood glucose level of hyperglycemic. • Vijaysar modulates tissue glucose utilization in insulin dependent tissues. • Vijaysar helps to overcome complications of chronic diabetes – delays onset of diabetic complications. • Vijaysar helps to reduce the glucose absorption from the gastrointestinal tract and improve insulin & pro-insulin levels. • Vijaysar reduces fasting & post parandial hyperglycemia. • Vijaysar regenerates beta cells of pancreas. • Vijaysar is found to have a hypocholesteremic effect. • Vijaysar reduces cardinal symptoms for diabetes like polyuria (production of large volumes of urine), Polyphagia (gluttonous excessive eating), Polydipsia (abnormally intense thirsts), burning pains in limbs & general weakness. • Vijaysar has been reported to have strong antihyperglycemic activity. The active flavonoid principle (+)-epicatechin exerts protective & restorative effects in diabetes. External Application is done in swelling, erysipelas. Leucoderma, dermatoses, and allergic dermatitis. Local application of the resin strengthens loose teeth. Resin and bark are used in diarrohea and dysentery. It is very useful in infants and women, raktgami vatapitta disorders. It is an excellent remedy for fractures and is also a rasayana.